Judge Seider served the citizens of Dallas County as a Felony Prosecutor in the Dallas County District Attorney’s Office – with the Child Abuse Division. He went on to the private practice of law and developed a deep respect for protecting the due process rights of his clients in the civil and criminal courts—a perspective that is used on a daily basis in the courtroom, as well as in the educational endeavors that are part of serving as a justice of the peace. The Texas Supreme Court unanimously appointed Judge Seider to the Texas State Commission on Judicial Conduct—the sole Justice of the Peace on the 13-member body charged with investigating and responding to complaints of judicial misconduct of any Texas judge or justice. He continues to serve as a resource for the Commission and makes himself available to mentor judges. Judge Seider has been the driving force for a Homeless Court that he has presided over for the past 18 years. He has established a model that has been shared with judges throughout Texas for initiating and maintaining working relationships with the legal community, nonprofit organizations serving the homeless community and volunteers. Judge Seider continues to donate his time and expertise in performing pro bono services for indigent individuals that need assistance or representation in having dismissed criminal charges expunged from their records. 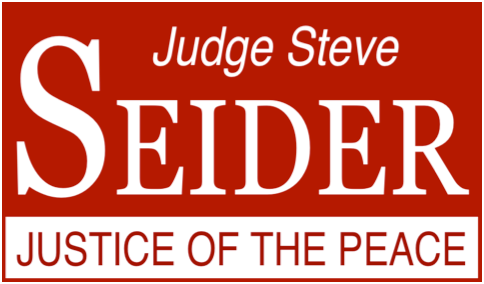 Judge Seider graduated from the University of Houston Law School and has been a licensed Texas attorney for more than 26 years. He achieved a degree in Finance, with Honors, from the University of Texas at Arlington prior to attending law school. He was also commissioned as a U.S. Army Field Artillery Officer, and served for thirteen years, including as a Battery Commander, in the U.S. Army Reserves. Judge Seider and his wife Angie have been married for 34 years; they are parents to four adult children and grandparents to a precious granddaughter.